Obesity can be set in the early years of a child’s life? New research based on the Early Bird Study of children from birth to puberty and published in the Herald Sun December 19th 2008 found that obesity is determined before the age of five. The study found that at birth children were the same weight as children born 25 years ago but by puberty they’d gained more fat compared with children of the same age in the 1980s. Most of the excess weight was put on before the age of 5. The early development of fundamental motor skills is important for children’s development? "For toddlers, basic movement skills such as running, jumping, throwing and kicking do not just appear because a child grows older, but emerge from an interaction between hereditary potential and movement experiences. These behaviours are also clearly influenced by the environment. For instance, “a child who does not have access to stairs may be delayed in stair climbing and a child who is discouraged from bouncing and chasing balls may lag in hand-eye coordination." How students feel about themselves can be influenced by their physical skills? "Students who have achieved fundamental motor skill competence have been found to perceive themselves as being competent, socially accepted and to have a positive attitude towards physical activity. In essence, fundamental motor skill competence assists in preparing students for a healthy lifestyle." Ball handling activities promote brain connections? "Some ways that we move actually improves learning. When children use both sides of their brain, functioning is enhanced." Sporteka coaches are passionate and qualified professionals? Head coach and developer of Sporteka, Fatima Tawfek, is a FFV accredited soccer coach, Tennis Australia Qualified Development Coach, a registered MLC Tennis Hot Shots deliverer and Tot Ball instructor. Fatima in fact teaches your child well-researched and documented skills from local, national and international sources. Other sporteka coaches also have suitable experience and qualifications and have passed working with children checks. We specialise in teaching tennis to very young children in comfortable indoor environments? Sporteka introduces your child to Tennis as part of the Multisports program. If your child shows an interest in Tennis why not enrol him/her into our ‘Learn and Play’ Tennis program. Not only will your child have fun participating in a unique Tennis format but he/she will also develop the skills necessary to participate in future Talent ID events, appear in front of Australian open spectators on kids on court showcase days at the Australian open, compete in red, orange or green ball challenges and have fun experiencing the world of tennis around champions of the game. Talent Search is a new and exciting national program designed to identify young and exciting athletes aged between 6years and 11 years old who have a desire and capacity to play and excel in sport. The Talent Search program caters for athletes from tennis and non-tennis backgrounds and different Talent Search days have been set up to allow a wide range of children from all parts of the community to participate. More information can be found on www.tennisaustralia.com.au and click on Talent Search or Talent ID. If your child shows an interest in Athletics, why not try Little Athletics. The program accepts children from 5-14. The track and field season runs from September/October to the end of March. Sporteka introduces your child to Tennis as part of the Multisports program. If your child shows an interest in Tennis why not enrol him/her into Sporteka's MLC Tennis Hot Shots program. Not only will your child have fun participating in a unique Tennis format but he/she will also develop the skills necessary to participate in future Talent ID events, appear in front of Australian open spectators on kids on court showcase days at the Australian open, compete inTennis hot shots challenges and get ready to play inter-club competitions. In the meantime, I do encourage you to ask questions, explore options for your child, don’t take no for an answer or let someone convince you that it is too early to try a sport if your child is keen to Have a Go; above all DO expose your child to as wide a range of physical activities as possible so he/she can choose the sport/s he/she most enjoys and stay Active For Life. Thank you for being part of the Sporteka experience. Want to teach them Tennis? Start with Sporteka! Sporteka develops Sports Stars of the future. "Early experiences are critical for future development and learning. The first 5 to 6 years of life are particularly critical for the development of fundamental motor skills: walking. 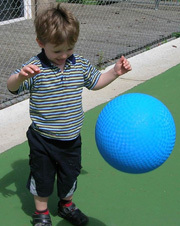 running, jumping, hopping, galloping and skipping; and for ball handling skills: throwing. catching, kicking and striking"
©2019 Sporteka Kids. All Rights Reserved.